Example 6 Is 2352 a perfect square? 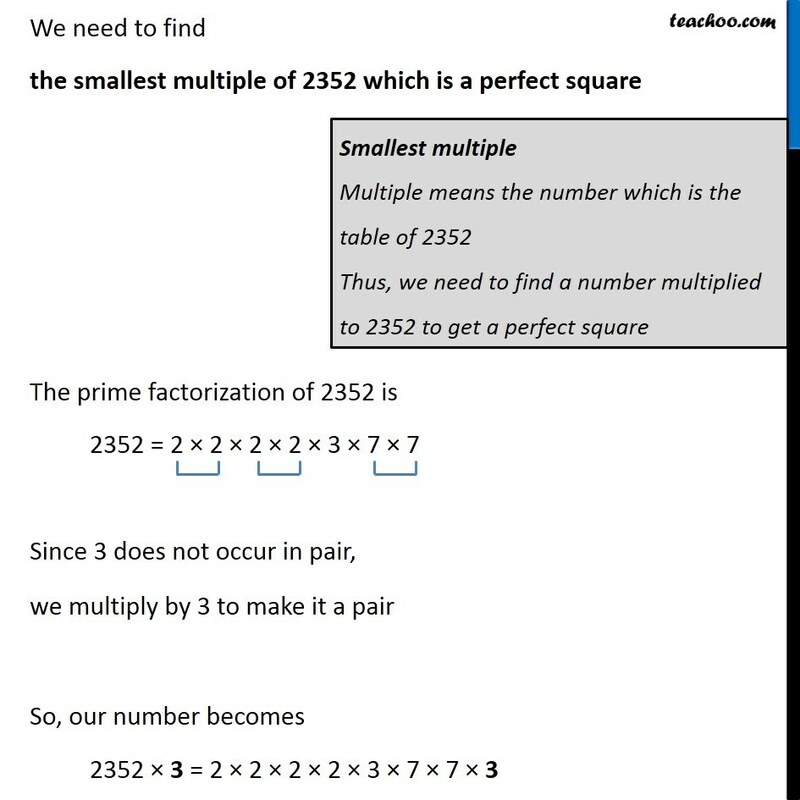 If not, find the smallest multiple of 2352 which is a perfect square. 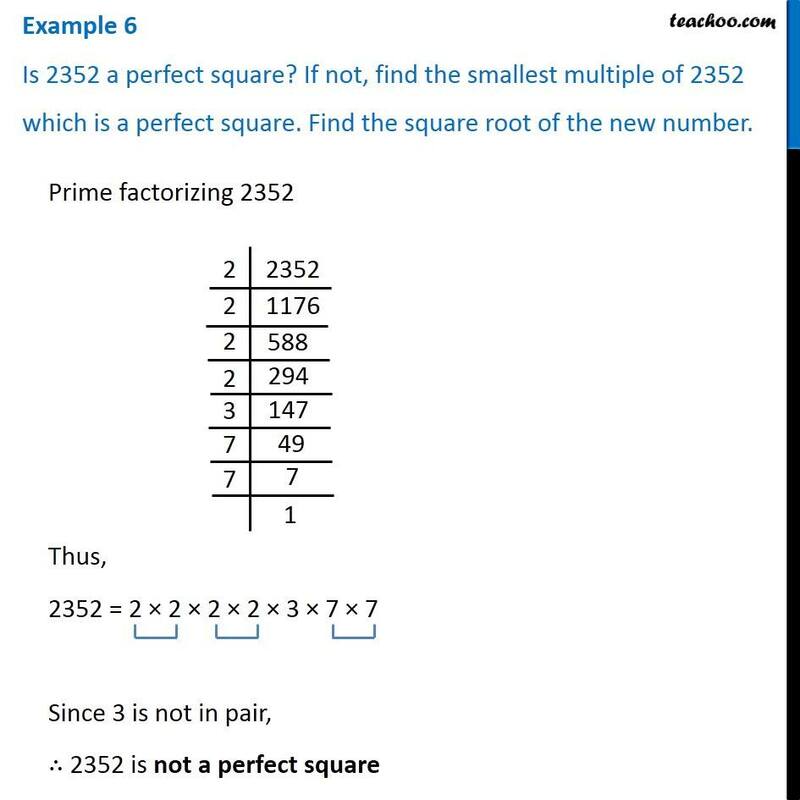 Find the square root of the new number.Prime factorizing 2352 Thus, 2352 = 2 × 2 × 2 × 2 × 3 × 7 × 7 Since 3 is not in pair, ∴ 2352 is not a perfect square We need to find the smallest multiple of 2352 which is a perfect square The prime factorization of 2352 is 2352 = 2 × 2 × 2 × 2 × 3 × 7 × 7 Since 3 does not occur in pair, we multiply by 3 to make it a pair So, our number becomes 2352 × 3 = 2 × 2 × 2 × 2 × 3 × 7 × 7 × 3 Smallest multiple Multiple means the number which is the table of 2352 Thus, we need to find a number multiplied to 2352 to get a perfect square 7056 = 2 × 2 × 2 × 2 × 3 × 3 × 7 × 7 Now, it becomes a perfect square. Hence, 7056 is the smallest multiple. 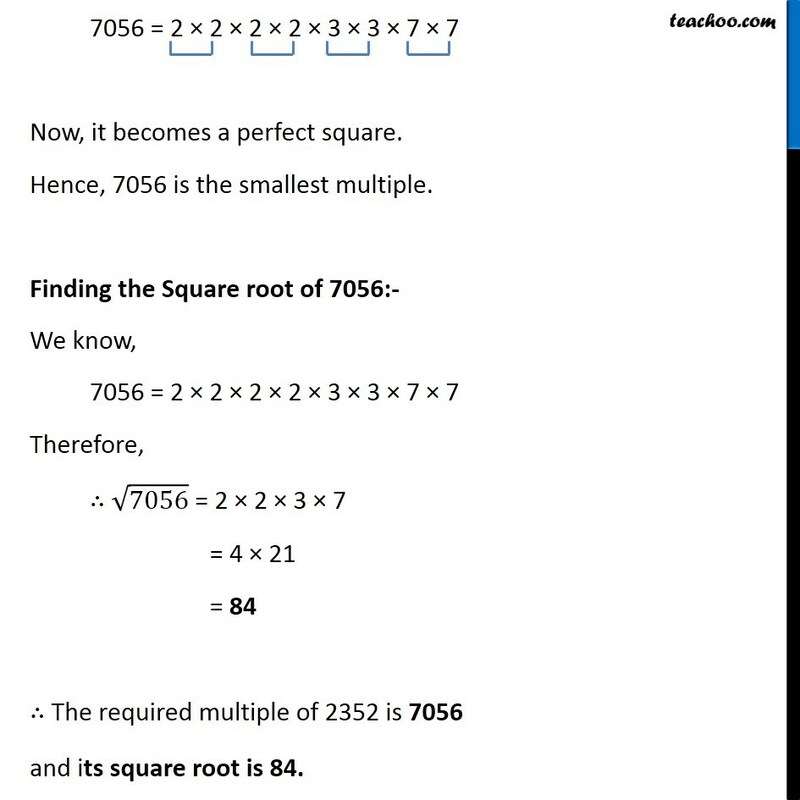 Finding the Square root of 7056:- We know, 7056 = 2 × 2 × 2 × 2 × 3 × 3 × 7 × 7 Therefore, ∴ √7056 = 2 × 2 × 3 × 7 = 4 × 21 = 84 ∴ The required multiple of 2352 is 7056 and its square root is 84.